An Adverse Childhood Experiences (ACE) checklist has been used in numerous studies to collect sensitive information on types of childhood trauma: physical abuse, sexual abuse, alcoholic or drug addict parent, family member in jail, battered mother, parent with mental illness, loss of a parent, physical neglect, emotional neglect, or verbal/emotional abuse. These studies have consistently found an association between ACEs and adult chronic disease. 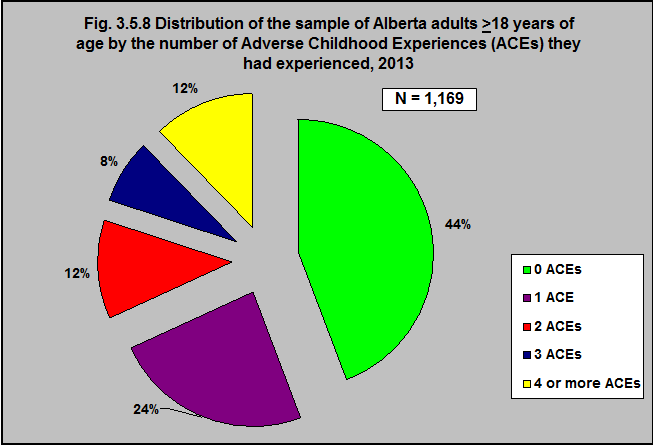 In 2013, the Alberta Adverse Childhood Experiences Study modified the ACE Checklist so that it was appropriate for interviewing people about sensitive issues over the telephone. A survey was conducted among 1,169 Alberta adults ≥ 18 years of age. They asked 8 questions about two main areas of childhood trauma: childhood abuse and growing up in a household where there was family dysfunction. Fifty-six percent of the adults surveyed had experienced as least one ACE before the age of 18. About half of these, 24% had experienced one ACE. 12% had experienced 4 or more. Evidence indicates that children who suffer trauma, such as abuse, neglect, living in a home where there is violence, or having a parent who is mentally ill have twice the risk of conditions like obesity, cardiovascular disease, addiction, and depression as adults. The results demonstrated that adverse childhood experiences (ACEs) were common and there were strong associations between childhood trauma and increased risk for poor health outcomes in adulthood.